These are refrigerator pickles. They are delicious and easy to make, but they will only be good for 2 months in the refrigerator (if they aren’t eaten by then). They won’t help you survive the winter. They won’t make it until January when you might decide, on a warm winter night, to roast hot dogs over a bonfire in the yard. And when the skin is crackling black and you crave a vinegar-y, cold dill alongside that still smoking meat, you won’t get one. Because refrigerator pickles are not Grandma’s pickles. They aren’t the ones she taught me to make when I was 12 and helped her lift the steaming Ball jars from the boiling water that sterilized them. That’s the difference. 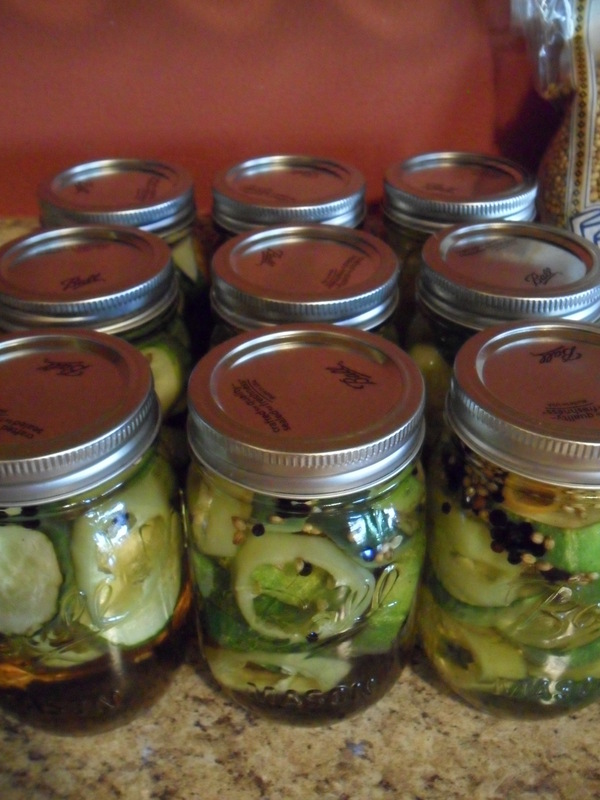 It isn’t what’s in the brine or the kind of cucumber; it’s the process of sterilizing the jars and boiling the filled jars in a “bath” until that thin metal lid POPS, signaling that all is well. That the seal is good and the food safe from spoiling; that you have done what needed to be done to “put up” food for the year. 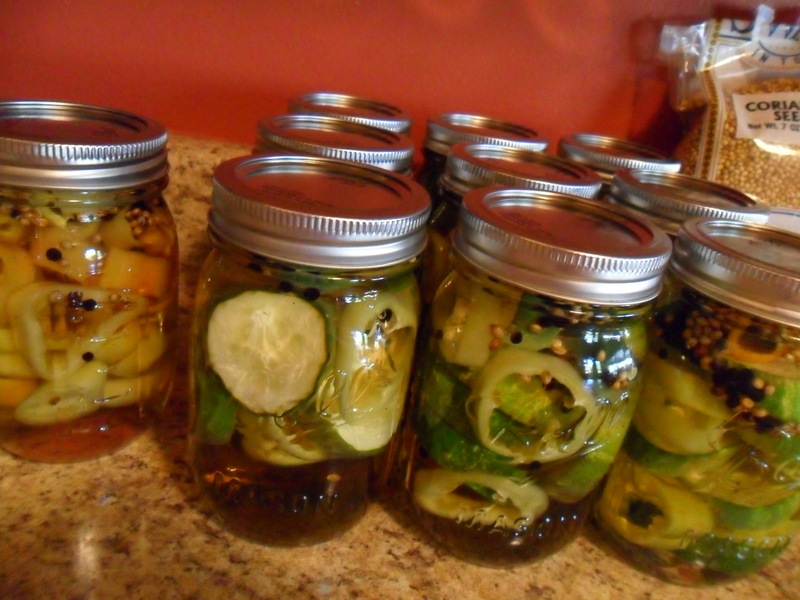 –and there seems little time nowadays for pickling. But I am still proud of our Ball jars full of refrigerator pickles lined up on the counter. The garlic dill spears, the sweet and sour slices, the HOT peppers. My girls and I are a step closer to the longer process. Next year the garden will be bigger. We’ll make more pickles. We’ll become more self-sustainable. We’ll spend more time together burning our fingers on hot jars and doing things the way Grandma taught me, with hard work and love and extra garlic. We tried out the dills today even tho it’s a little early. Really like them. Would make sure each jar has some of the garlic cloves. Tasty Yummies has some great recipes. Check out her blog. Thanks for reading!